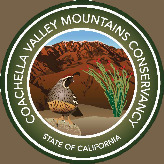 The Coachella Valley Mountains Conservancy (CVMC) is a 21-member governing board designed to preserve natural and cultural resources in the area surrounding Coachella Valley. It does so by acquiring mountainous lands for open space while providing for the protection of wildlife and enhancement of recreational and educational experiences. The conservancy, which is in the Natural Resources Agency, has helped protect 65,000 acres in the San Jacinto Mountains and Santa Rosa Mountains, land that stretches through the Mojave Desert bordering Joshua Tree National Forest into Riverside County. Its primary source of funding for acquisitions ($36 million) is from Proposition 84, the Safe Drinking Water, Water Quality and Supply Flood Control, River and Coastal Protection Bond Act of 2006. Approximately 100 miles inland from Los Angeles, the low-elevation Coachella Valley is home to more than 27 plants and animal species that are rare, threatened or endangered. The deceptively barren desert is also sought after real estate for 3.5 million-plus tourists and 19,000 new residents that come to Coachella Valley each year. The tension between development and conservation in the valley has been evident for at least 100 years. In 1897, President Grover Cleveland established the San Jacinto Forest Reserve to protect the watershed there. In the decades that followed, the Mount San Jacinto State Park was forged through land swaps and purchases involving the Southern Pacific Railroad, the County of Riverside, the State Parks Commission and the U.S. Forest Service. And President Franklin Roosevelt established the Joshua Tree National Monument in 1936. Development began to grow in the valley after World War II while conservation efforts continued apace. The Deep Canyon Desert Research Center was established in 1959 when Phillip A. Boyd donated money and land in the Santa Rosa Mountains to the University of California. The federal government established wilderness areas in San Jacinto, Santa Rosa, San Gorgonio, Mecca Hills and Orocopia Mountains, and the state Wildlife Conservation Board bought 26,000 acres in the Santa Rosa Mountains in the 1970s and ‘80s. The federal Bureau of Land Management designated “areas of critical environmental concern” in Whitewater Canyon, Big Morongo Canyon, Willow Hole-Edom Hill, and Dos Palmas, east of the Salton Sea. A six-inch frog put a giant spotlight on the struggle between developers and conservationists in the region in 1980. The valley was in the middle of a $19 billion building boom when the U.S. Fish and Wildlife Service put the native fringe-toad lizard on its endangered-species list and brought construction to a screeching halt. A five-year battle ensued before the Coachella Valley National Wildlife Refuge was established to protect the lizard, about the same time the Coachella Valley Preserve was established. The hotel got built, but out of the opposition came a nucleus of activists who pushed for the conservancy, formed its nonprofit sister organization (the Desert Mountains Land Trust), and helped establish the Santa Rosa and San Jacinto Mountains National Monument. Governor George Deukmejian vetoed legislation in 1989 that would have established the conservancy. But two years later, after the federal Bureau of Land Management designated lands in the Santa Rosa and San Jacinto Mountains as a National Scenic Area in 1990, the governor signed the enabling legislation. The conservancy protects an area bordering the Sonoran Desert, stretching from the highest point of the San Jacinto Mountains to the eastern portion of Riverside County across to the San Bernardino Mountains and down to the northern section of the Salton Sea. The conservancy operates largely off money from voter bond measures: $5 million from Proposition 12 in 2000; $20 million from Proposition 40 in 2002 and $36 million from the $5.4 billion Proposition 84, the Safe Drinking Water, Water Quality and Supply Flood Control, River and Coastal Protection Bond Act of 2006. In 2008, 14 contentious years after setting out to create a comprehensive plan to conserve protected species while promoting economic growth, local and state jurisdictions under the guidance of the conservancy approved the Coachella Valley Multiple Species Habitat Conservation Plan (CVMSHCP). The 75-year plan provides protection for 24,000 acres of open space for 27 endangered and threatened species. The large-scale regional blueprint attempts to cater to both development and conservation interests in desert land that covers 1.1 million acres by designating specific areas for conservation that require a mitigation fee to utilize if they are not off limits entirely. Private developers and government planners are meant to be spared a large measure of uncertainty and other impediments, expediting projects while enhancing public conservation efforts. The Coachella Valley Mountains Conservancy acquires mountainous lands for open space while providing for the protection of wildlife and enhancement of recreational and educational experiences. The conservancy protects the San Jacinto Mountains and Santa Rosa Mountains, land that stretches through the Mojave Desert bordering Joshua Tree National Forest into Riverside County. Its latest source of funding for acquisitions ($36 million) is from Proposition 84, the Safe Drinking Water, Water Quality and Supply Flood Control, River and Coastal Protection Bond Act of 2006. But the conservancy also received $5 million from Proposition 12 in 2000 and $20 million from Proposition 40 in 2002. It used that money for direct acquisitions and grant programs that conserved 25,000 acres of strategic open space. The 21-member governing board of local, state and federal partners actively acquires land to help complete the hodge-podge of national monuments, parks and habitat preserves in the desert that has evolved over the last 100 years. The board includes council members from seven cities, the Agua Caliente Band of Cahuilla Indians Tribal chair, University of California desert studies member, governor, state Senate and Assembly appointees, state Park and Game representatives, as well as National Land, Park, Forest and Conservation directors. The board meets bi-monthly to decide the diverse and invested interests of the greatly expanding region. Since its inception in 1991, the conservancy and partners have preserved 65,000 acres. The large governing board may authorize grants to cities, counties, conservation districts or nonprofits to accomplish conservation goals and complete projects. Acting as both the progress and follow-up accountability, the CVMC board represents local, state, and national jurisdictions, as well as Aqua Caliente Band of Cahuilla Indians, a Palm Springs-based tribe that also owns a casino in the valley. The conservancy is the author of the Coachella Valley Multiple Species Habitat Conservation Plan (CVMSHCP), an overarching 75-year project that provides a blueprint for development and conservation in almost 70% of disjointed open space in the 1.1 million acres of Riverside County. About 25% of the land is publicly owned, included a large portion of the Joshua Tree National Park, and home to 27 threatened or endangered species. The Coachella Valley Conservation Commission was created to implement the plan. Groundwork for the plan began in 1994 but it took 14 years of difficult negotiations between stakeholders to hammer out an agreement. The aim was to conserve designated areas for endangered species and sensitive ecosystems, open others totally to development and charge mitigation fees for development in others. Implementation over the life of the plan is expected to cost $645.2 million (in 2006 dollars), and it is designed to be self-funding. The cities of Desert Hot Springs and Indio were reluctant to cooperate with plan designers because areas they regarded as potential development sites would be in conservation areas. Individual property owners feared for their projects. Environmentalists were wary of politics, not science, ruling the day. Local biologists were feuding with their brethren in state agencies. And everyone was mad at the U.S. Wildlife Service. After 14 years of debate and compromise, the plan was finally revised and approved in 2008. · Fostered a wildlife movement corridor between the San Jacinto and San Bernardino Mountains, including through a wash at Stubbe Canyon. · Funded the purchase of more than 700 acres in Whitewater Canyon, bringing near all the land along the Whitewater River into conservation ownership. The land, which is also a wildlife corridor, is a crucial migratory bird way station and provides habitat for several endangered birds, an endangered plant, the threatened desert tortoise, bighorn sheep, mountain lions, black bears, bobcats and more. · Provided grant money to Friends of the Desert Mountains for purchasing land in the Andreas Hills upon which it will build a trail and trailhead facility that will link to an existing trail network in the area. · Purchased more than 26,000 acres in the Santa Rosa and San Jacinto Mountains National Monument. · Funded the purchase, or bought outright, 6,500 acres in the Coachella Valley Fringe-Toed Lizard Preserve for protection of rare palm oases, sensitive habitat and numerous sand-dependent species, including Coachella Valley round-tailed ground squirrel, Coachella Valley milkvetch, Coachella Valley giant sand-treader cricket, flat-tailed horned lizard, Palm Springs pocket mouse and the lizard himself. · Organized local, state and federal agencies and non-profit organizations to prevent a large development in the Joshua Hills by purchasing 9,000 acres for $26 million. The acquisition increased the Coachella Valley Preserve by 50% and sustained palm oases, sand dunes and the endangered desert tortoise. · Put together a partnership to purchase 5,400 pristine acres at the edge of the Santa Rosa Mountains, west of the Salton Sea, that will provide protection to endangered Peninsular bighorn sheep, burrowing owl, nighthawks, and many other animal species. · Continues to pursue the Thermal Canyon project, a significant wildlife corridor between the Mecca Hills Wilderness south of Interstate 10 and Joshua Tree National Park north of the freeway. The project seeks to buy private property along and adjacent to the canyon because it is suitable for numerous large mammals and other small animals like the desert tortoise. Other ongoing projects and their funding status are reported at the state’s Bond Accountability website. Just over half (55.1%) of the Coachella Valley Mountains Conservancy’s $490,000 operating budget in 2012-13 comes from the California Environmental License Fund. Reimbursements from other organizations for services rendered covers most (26.7%) of the rest. The staff is small—usually three members, but just two in 2012—and accounts for 61% of expenses. The conservancy generally expends a much larger sum of money—funds gleaned from voter-approved bond issues—on land acquisitions by either purchasing land outright or facilitating purchases and exchanges by third parties. It received $5 million from Proposition 12 in 2000; $20 million from Proposition 40 in 2002 and $36 million from the $5.4 billion Proposition 84, the Safe Drinking Water, Water Quality and Supply Flood Control, River and Coastal Protection Bond Act of 2006. The conservancy awarded 23 contracts under Prop. 12 and 28 contracts under Prop. 40, including $9.5 million for acquisition of the 8,881-acre Cathton property, which protects a critical wildlife corridor between the Coachella Valley Fringe-Toed Lizard Preserve and Joshua Tree National Park, and $4.2 million for a 731-acre corridor in the San Gorgonio Pass. As of January 1, 2012, all but $180,001 of the Prop. 84 money had been allocated. When The Nature Conservancy established the Coachella Valley Preserve in 1984, it set about buying 20,000 acres of desert, rocks and lots of sand, bisected by the San Andreas Fault, just east of the San Bernardino Mountains. The endangered fringe-toed lizard and desert tortoise, and other creatures called the sand dune-laden habitat home. The 9,000-acre Joshua Hills, a sparse, sloping area nearby, was pretty much ignored until 1996 when Oregon developer Curtis Pickering announced his intention to put a mini-city there. He envisioned a luxury community with 7,000 residences and 12 golf courses, three hotels, shopping centers and a university; a business park with 3 million square feet of commercial and industrial space; and an urban infrastructure to support it. The new neighbors were certain to have a significant impact on the preserve, and development would gobble up critical land used as a corridor to Joshua Tree National Park just three miles away. Environmentalists warned that golf courses might use up water that would normally flow to the preserve’s palm oases, which nurture the endangered desert pupfish and neotropical songbirds. An array of local, state and federal government along with nonprofit organizations resisted the developer and in August 2003, Palm Springs developer Richard Oliphant, who had bought the property three years earlier, gave up. “We just don't have the political support,” he said. Sale negotiations ensued. The conservancy and other interested parties sough to strike a deal with the developer. And it looked like they had one. But in October 2003, the state Department of General Services (DGS) rejected the appraisal of $26 million provided by The Nature Conservancy, opting for a much lower $8 million to $11.5 million assessment. Nature Conservancy senior program manager E.J. Remson said an earlier appraisal came in at $40 million. The appraisal blocked participation by the state Wildlife Conservation Board that had already pledged $5.1 million. The board contested the rejection and a new, more detailed appraisal was ordered. It came in at $28.4 million, the DGS gave its assent and a year later the deal was done at the original $26 million price. In 2008, shortly after it finished spending $24 million it received from Propositions 12 and 40, the conservancy was audited by the Department of Finance. The department wanted to know how the conservancy had handled its money, in light of it having just received another $36 million from Proposition 84. Evocation of the 1973 U.S. Endangered Species Act (ESA) can be an instant roadblock to a project proposal or a pre-emptive deterrence to long-term development. Prior to 1982, the Act proclaimed an absolute ban on the take of federally-listed endangered species. But an amendment to the Act that year provided federally approved mechanisms to satisfy the endangered species segment of an environmental review. Habitat conservation plans (HSP) were created to allow incidental harm to endangered species resulting from otherwise legal activities such as road building in exchange for agreed upon conservation and mitigation measures. Habitat conservation plans are often complicated endeavors and can take time to draft and implement. They are generally designed to balance economic and environmental interests by laying out an unambiguous blueprint for development and conservation. Some land is designated off limits to development and other land is wide open, but inherent to the plans are mitigation measures that allow some land to be developed under strict guidelines after the payment of a fee used to foster further conservation. The Coachella Valley Multiple-Species Habitat Conservation Plan, developed by the conservancy and myriad stakeholders across the region, took 14 years to reach fruition. The 2008 agreement created a new network of nature reserves encompassing dozens of sensitive species and ecosystems. The 75-year preservation project designates almost 70% of disjointed open space in the 1.1 million acres of Riverside County as protected species habitat. The effort to forge agreement between officials in Riverside County and nine cities, along with other local, state and federal agencies and non-profit organizations temporarily fell apart in 2001 as even scientific advisers couldn’t agree on the contours of a consensus. In the end, albeit belatedly, even lone holdout Desert Hot Springs joined the pact. But not everyone was happy. The cities of Indio and Desert Hot Springs were early antagonists to the plan when it became apparent that their proposed growth areas fell on the conservation side of a line drawn in the sand by plan proponents. Desert Hot Springs wanted to build a 1,700-acre, 200-room golf resort in one of the conservation areas. The Palmwood development would have 2,200 residential units, 45 holes of golf, a golf school and the backing of pro golfer Phil Mickelson. The cash-strapped city viewed the development as a savior and did not want to adhere to habitat limitations on building permits under the plan. The golf course would have bordered the Joshua Tree National Park. Indio Mayor Gene Gilbert initially called the plan “developmental suicide” because it threatened to impair development of 2,500 acres just north of the town. And a proposed 10,000-unit housing development in Paradise Valley, between the city of Coachella and the Salton Sea in unincorporated Riverside County, also appeared to be an endangered species. The plan pitted community against community and at one point Riverside County supervisors threatened to scuttle any attempts to annex adjoining properties for development by any city that failed to sign the habitat conservation plan. Republican state Senator Jim Battin countered with his own threat to introduce legislation that would forbid attempts to coerce public officials into voting a certain way on the plan. Even scientists couldn’t agree on how to proceed. Local biologists clashed among themselves and with their regulatory brethren, especially in the U.S. Fish and Wildlife Service (FWS), over where to draw conservation boundaries. Some likened it to ‘‘epistemological arteriosclerosis,’’ or ‘‘hardening of the categories.’’ The whole process was impeded by constant turnover at the federal agency, leading to local accusations of inconsistency and capricious behavior by the feds and the California Department of Fish and Game (CDFG). Conflicts abounded. One of the two studies, focused on a multi-species plan in Western Riverside County, found a general perception that infrastructure projects were accelerated, litigation was reduced, interagency cooperation increased, project costs declined, and requirements for endangered species protection were fulfilled. An independent report by Management Systems International for the Fish and Wildlife Service in 2009 looked at 12 HCPs and concluded that they were an effective mechanism for “avoiding, minimizing and mitigating take” of listed endangered species. In some cases, the HCPs contributed to species recovery. They also increased the visibility and importance of ecological issues among land use planners, facilitated replacement of lost habitat with replacement property at a 2:1 ratio and generate significant amounts of useful scientific data through mandated monitoring programs. Although there may not be a comprehensive survey of how HCPs have fared over the years, they have proved wildly popular. As of 2010, the Fish and Wildlife Service had approved 670 plans across the country. Many of HCPs are small and targeted at specific development issues, but their use is highly diversified. Most are used to facilitate residential and commercial development, but a few dozen authorize transportation infrastructure activities. At least 99 HCPs consist of more than 1,000 acres and more than half of those are in Nevada and California. HCPs are eligible for federal funding and in 2011 the Fish and Wildlife Service approved grants of $24 million to support habitat acquisition and conservation planning in California, including the Coachella Valley plan.